Arturo Martinez-Sanchez kisses his son, Alejandro, 5, before going in for surgery to repair his skull Sept. 12, 2012 at Valley Hospital in Las Vegas. Editor's Note: The information presented in this series is based on the reporter's direct observations, conversations, interviews and public records including the Metro Police arrest report, the grand jury transcripts of testimony by Cristopher Martinez, teacher Candace Wagner and various law enforcement officers. The reporter did not ask brothers Cristopher or Alejandro Martinez to recollect their memories of April 15, 2012. The boys will not be attending school this September morning. Instead, they will accompany their dad to the hospital, where Arturo Martinez-Sanchez will undergo his third surgery in five months, after being struck hard on the head by what police say was a hammer. The first two were brain surgeries and involved the repair of a brain laceration toward the front of his head. This one, a cranioplasty, will fix a skull indentation on the back of his head, made by the intruder who raped and killed his wife and 10-year-old daughter in April. 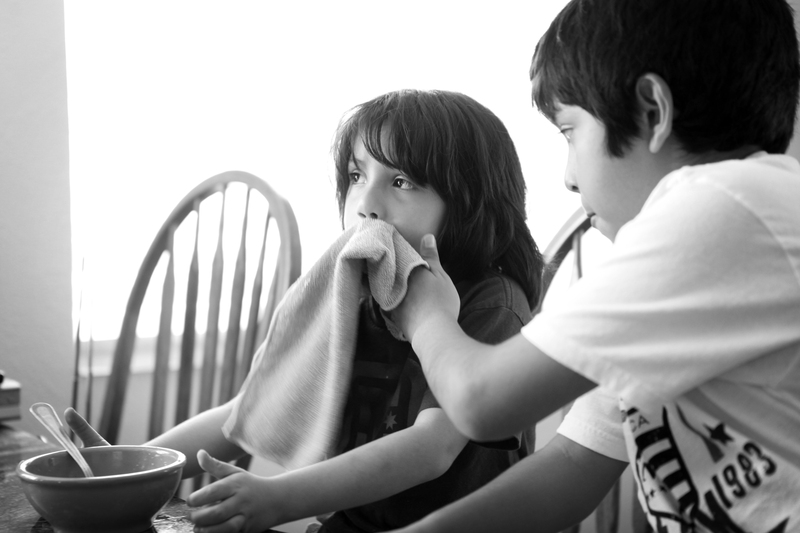 Cristopher Martinez, 10, right, wipes his 5-year-old brother Alejandro's mouth during breakfast on Sept. 12, 2012 in Las Vegas. And this is how Arturo has prepared for it — by creating a 21-page last will and testament. It’s sitting on the counter as Alejandro and Cristopher eat breakfast. “If I was lost, I need my sons taken care of,” the 39-year-old single father says of the document. The night before, his sister, Gaudia Martinez-Sanchez, made flan, his favorite dessert. He snacked on the custard treat, along with chips, fruit and cereal before fasting for the surgery. Arturo and his boys temporarily live with Gaudia, her husband and her teenage son; Arturo is her older brother and the reason she moved to the United States. She tries to give him his space. She lets him come to her. Last night, however, she broke her usual silence and gently prodded Arturo about his feelings. “You know, what else can I be nervous for?” Arturo told her. The three-letter question might be impossible to answer: Why? Why did the suspect pick that modest, one-story home on Robin Street? Why did he attack Arturo; his wife, Yady; and daughter Karla; but not harm the couple’s two youngest children, Cristopher and Alejandro? Why did this happen to them? The questions run through Arturo’s head on a daily basis. All Arturo knows is he awoke mid-morning Sunday, April 15, and found a horror story within his home. Then he felt something wet trickling down his face. Blood. Arturo drifted in and out of consciousness for the following 24 hours. On Monday morning, police arrived at the home after Cristopher walked to Mabel Hoggard Elementary School and told school officials a chilling statement: His mother and sister were dead. Detectives combing the crime scene two days later found a hammer at the bottom of a hole in a cinder-block wall lining the north side of the Martinez-Sanchez family’s backyard. The hammer, with a wooden handle and silver head, was stained with blood. The discovery supported what doctors suspected: A blunt-force object had been the perpetrator’s weapon. When Arturo arrived at University Medical Center, he was aphasic. He couldn’t speak. Dr. Logan Douds, an endovascular neurosurgeon, speaks about Arturo's injuries when he first arrived in the emergency room after the hammer attack. The injuries on his head spoke for themselves. Douds observed two depressed skull fractures — one on the top, or frontal region of his head, and another on the back side, or occipital region. The blows to the skull caused a cerebral hemorrhage, which acts like a stroke, in the frontal region, resulting in speech impairments. 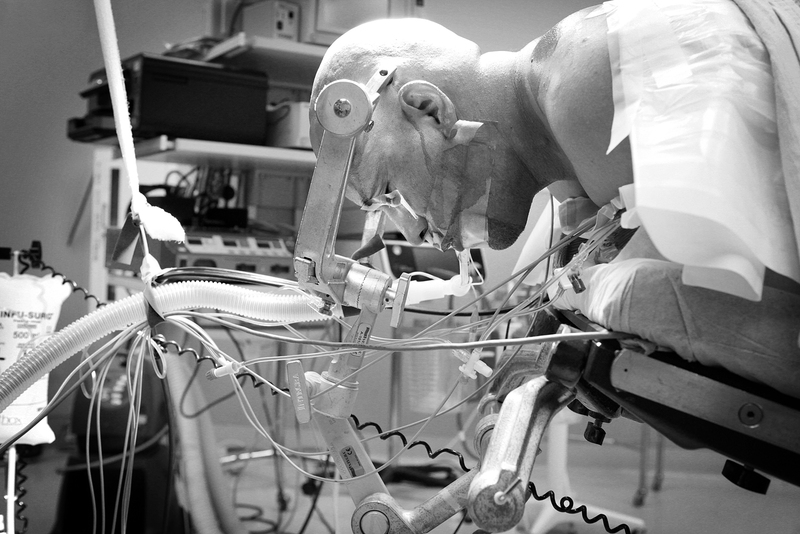 The injury demanded immediate attention, landing Arturo in the operating room that afternoon for his first brain surgery. Douds and his medical team lifted the skull fracture in the frontal region, washed out the affected underlying tissue and repaired the laceration. A couple of weeks later, Douds operated a second time, placing a piece of mesh over the skull defect. Arturo Martinez-Sanchez talks with friends and family before going into brain surgery Sept. 12., 2012, at Valley Hospital, to repair an indentation in his skull that resulted from a hammer attack. Douds didn’t consider Arturo’s head injuries life-threatening when they met, but no surgery is without risks, especially ones involving the skull and brain. Arturo had cleared his first two major medical hurdles. Translation: This part of the skull was so pulverized, the bone fractured in multiple pieces and detached from the rest of the skull. Headaches plagued Arturo throughout the summer. By this time, swelling had subsided, making it clear a deformity existed. But there was a catch: The deformed skull fragment was overlying a vein as large as its name — the superior sagittal sinus. Freeing the skull fragment could pose bleeding risks. “I made sure he really wanted to have the surgery done for that reason — knowing there’s risks involved,” Douds said. Arturo decided the potential good outcome was worth the risk. Days later, he called his attorney, Barbara Buckley, director of the Legal Aid Center of Southern Nevada, and asked for help drafting a will. 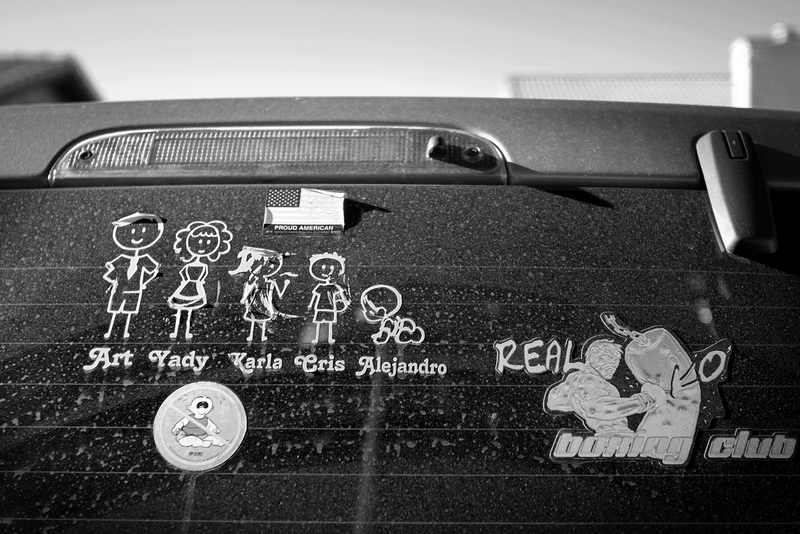 The car that Arturo Martinez-Sanchez drives, seen Aug. 27, 2012, still has the stickers representing his whole family, even though his wife, Yadira, and daughter, Karla, were killed in April 2012. Despite his sister’s pleas, Arturo insists on driving himself to Valley Hospital for the surgery. The boys pile into his red Ford Escape, which bears the marking of a proud parent: a decal on the back window depicting five stick figures, one for each family member. Gaudia follows in her own car but, before leaving, posts one last call for prayers on her Facebook account. It’s the second such message she has posted on the social-networking site. Her first message the previous night announced Arturo’s surgery and elicited an outpouring of support from friends and family in Las Vegas and beyond — another small reminder of strength in numbers. 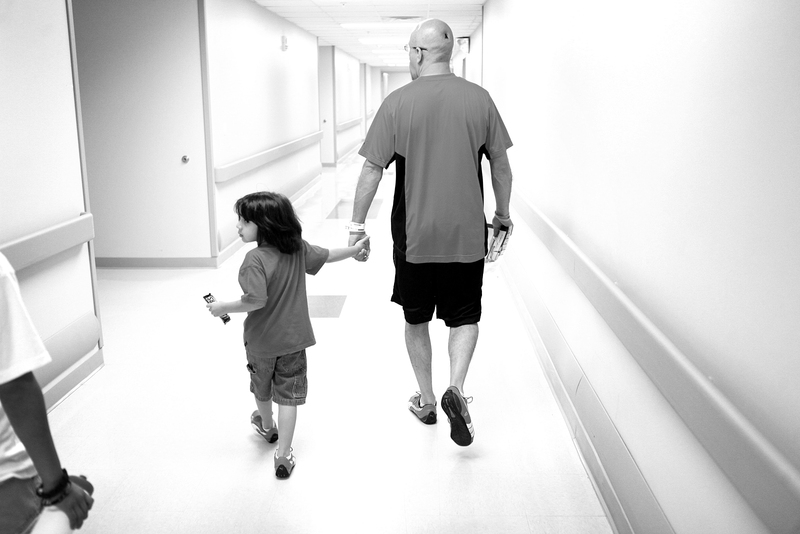 Alejandro grabs his father’s hand as the family wends its way through the off-white hospital hallways. The pre-surgery waiting room is quiet when they arrive. Arturo Martinez-Sanchez walks into Valley Hospital with son Alejandro, 5, on Sept. 12, 2012. Dr. Logan Douds will perform a cranioplasty to repair an indentation in Arturo Martinez-Sanchez's skull that resulted from the hammer attack. Gaudia envelops her brother in a long embrace before they sit down. The waiting begins, interrupted every so often by the arrival of more relatives. Eventually, the double doors next to the room open and a nurse summons Arturo for pre-surgery preparations. About 15 minutes later, nurses give family the all-clear to enter room No. 20 in the pre-op area. Arturo is lying in a bed dressed in a hospital gown, with a heated blanket over his body and an IV in his arm. This is not the man his sons are accustomed to seeing — the one clad in athletic gear and Puma sneakers, or jeans and cowboy boots. “Alejandro, come on over,” Arturo says. He makes the sign of the cross over his youngest child’s face as Alejandro begrudgingly relinquishes his hand-held video game. A nurse enters the room to outfit Arturo with special socks to prevent blood clots, but first she must squeeze her way past the eight family members and friends filling the tight room. Two more people arrive a short time later, including Danny Daniels, a family friend and senior pastor at First Southern Baptist Church south of downtown, who leads the group in prayer. The Rev. 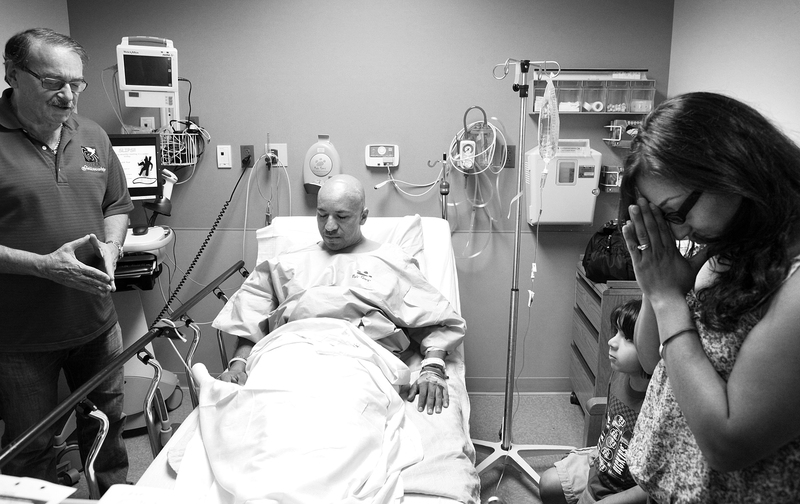 Danny Daniels of First Southern Baptist Church, left, leads a prayer for Arturo Martinez-Sanchez, center, before he goes into brain surgery Sept. 12, 2012, at Valley Hospital in Las Vegas. Dr. Logan Douds performed a cranioplasty to repair an indentation in Arturo Martinez-Sanchez's skull that resulted from a hammer attack. “We pray you be with Arturo,” Daniels begins. As if on cue, Douds arrives and explains the cranioplasty. 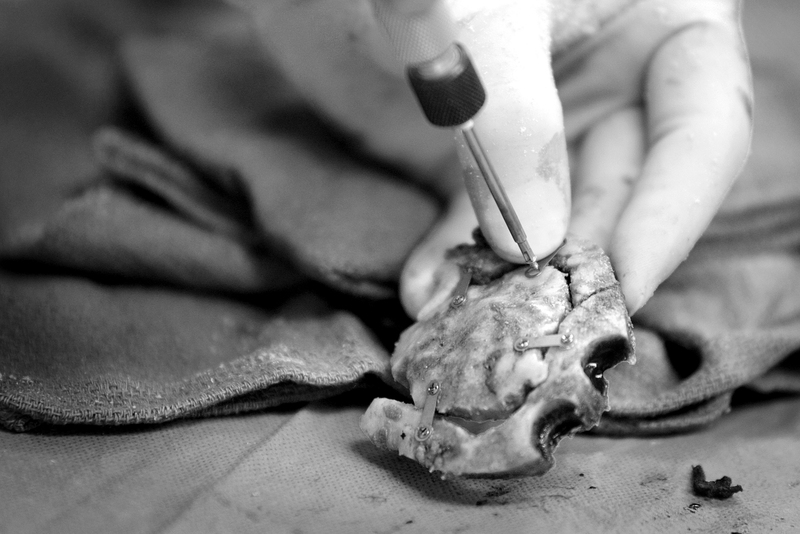 He reiterates the surgery’s biggest risk: removing the deformed skull fragment. Afterward, family and friends step into the hallway, leaving Arturo alone with his two sons. He whispers to them as they huddle next to his bed. He caps the short, man-to-little-man speech with high-fives for each boy. Cristopher, the older of the two, responds by burying his head in his dad’s arms. Alejandro just smiles. His last question, which is really more of a statement, is directed at Gaudia, who is standing in a corner of the room, fear etched on her face. Elumba clips the IV bag to Arturo’s hospital bed. The bed frames go up. Arturo gives his sons another hug. This time, Cristopher and Alejandro trace their hands from his head to his chest and side to side, creating two invisible crosses over their surviving parent. Then Elumba wheels Arturo out of his room and turns the corner, bound for operating room No. 1. Blue cloth obscures the identity of the patient lying facedown on the operating table, covered almost entirely. The problem spot — in this case, the back of a skull — peeks through an opening. But before the first cut or even the first touch, Elumba reads aloud patient facts as other members of the six-person medical team listen intently. 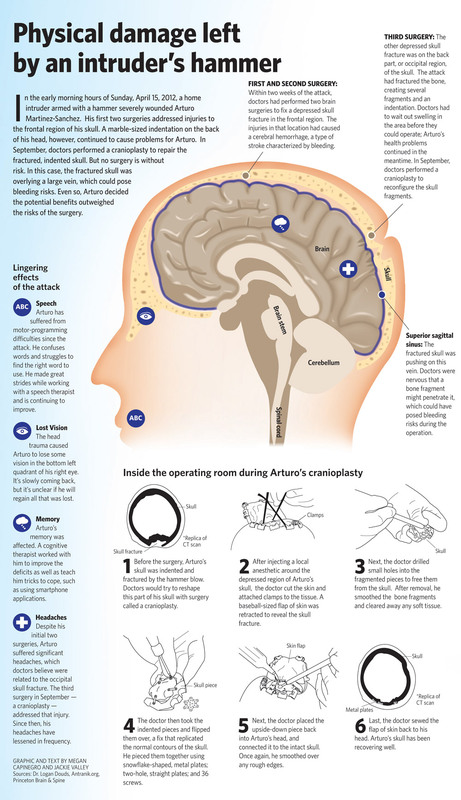 On the operating table, Arturo Martinez-Sanchez is knocked out by anesthesia before brain surgery at Valley Hospital in Las Vegas on Sept. 12, 2012. The surgery repaired an indentation in Martinez-Sanchez's skull that resulted from a hammer attack. The brain trust surrounding Arturo — a neurosurgeon, an anesthesiologist, a physician assistant, two scrub techs and an operating-room nurse — agrees in unison. “Time out at fifteen forty-nine,” Elumba says. It’s 3:49 p.m.
Douds injects a local anesthetic around the indentation on the back of Arturo’s head. Next, he slices the scalp and attaches green clamps to the skin tissue, following the path he made seconds earlier. Blood seeps out. Just as quickly, however, the physician assistant clears the incision line with a suction tube. The pair work in unison. Slice, clamp, suction. Slice, clamp, suction. The incision complete, Douds peels back the 3-inch-by-3-inch flap of skin covering Arturo’s skull and repositions the overhead light for closer examination. The polite statement underscores the vulnerability of the operation. At any point, something could go wrong, so the team must prepare for the unexpected, such as a blood transfusion. Douds clutches instruments in both hands and alternates back and forth, clearing soft tissue from the fractured bone below. Meanwhile, a scrub tech gracefully follows the surgeon’s moves and anticipates what he needs next. The rhythm continues until Douds — his white plastic gloves stained with blood — steps toward a notebook computer displaying scanned images of Arturo’s skull and brain. 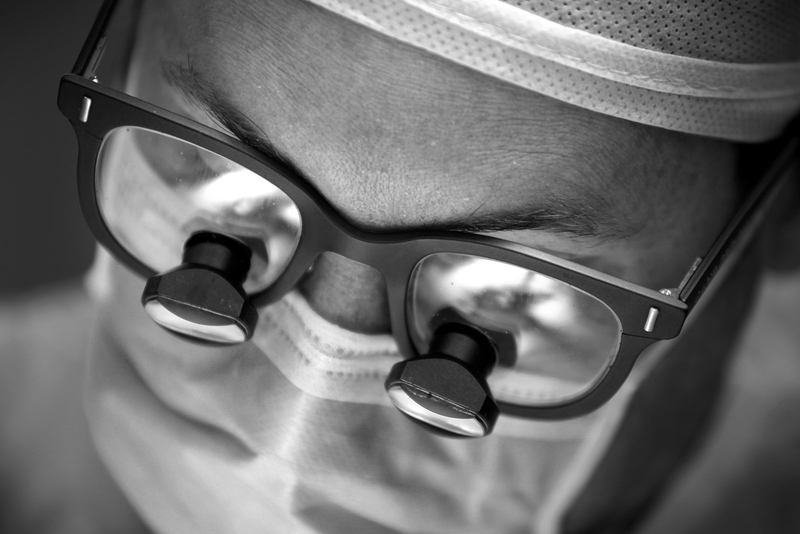 Dr. Logan Douds performs a cranioplasty at Valley Hospital in Las Vegas on Sept. 12, 2012, to repair an indentation in Arturo Martinez-Sanchez's skull that resulted from a hammer attack. Returning to the operating table, Douds drills small holes around the deformity and removes the fractured skull in several pieces. The removal does not disrupt the large, underlying vein. The team can take a deep breath. Now it’s all about cosmetics — turning those fragments into a more normal-looking skull. In this case, the solution lies in simply flipping the fractured segments. Like a puzzle, Douds pieces the inverted fragments together on a sterile instrument table across the room. 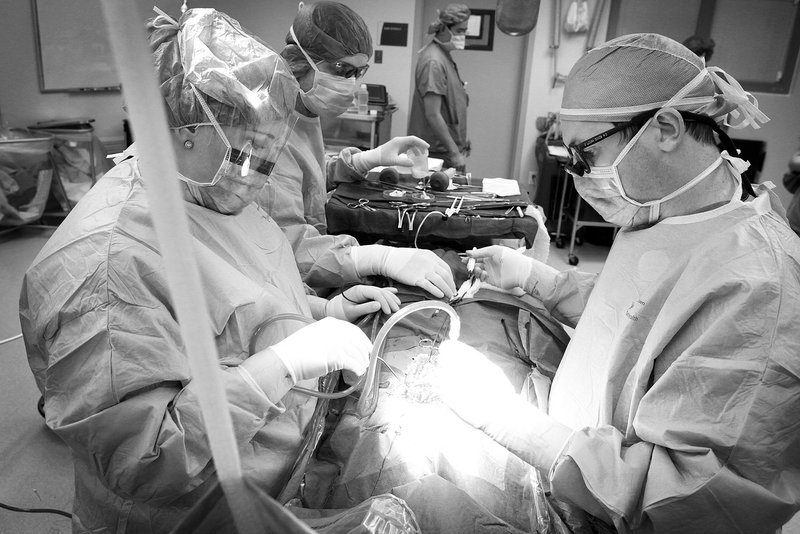 Dr. Logan Douds, right, performs a cranioplasty at Valley Hospital in Las Vegas on Sept. 12, 2012, to repair an indentation in Arturo Martinez-Sanchez's skull that resulted from the hammer attack. Several snowflake-shaped metal plates, two-hole straight plates and 36 tiny screws ultimately hold the refurbished skull fragments together. Douds gently places the now-whole fragment back in the gaping hole in Arturo’s skull and glides a drill with a burr over the bone, smoothing any rough edges. 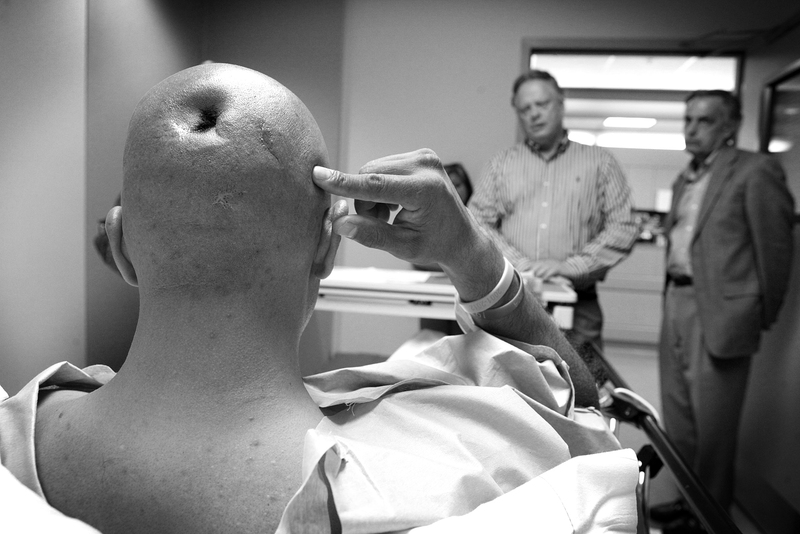 Dr. Logan Douds performs a cranioplasty to repair an indentation in Arturo Martinez-Sanchez's skull at Valley Hospital in Las Vegas on Sept. 12, 2012, that resulted from a hammer attack. The more-normal bone shape should take pressure off the covering of the brain, reducing the number of headaches. And the dent on the back of his head should be largely nonexistent, aside from some scarring. At 4:49 p.m., exactly one hour since Elumba called “time out,” Douds folds the skin flap back over the opening. He grabs thread and starts tying. The familiar face pauses at the hospital room doorway and does a double take. Arturo, the man who could barely speak when he entered the Nevada Community Enrichment Program several months ago, is sitting on a hospital bed, chatting with his sister. 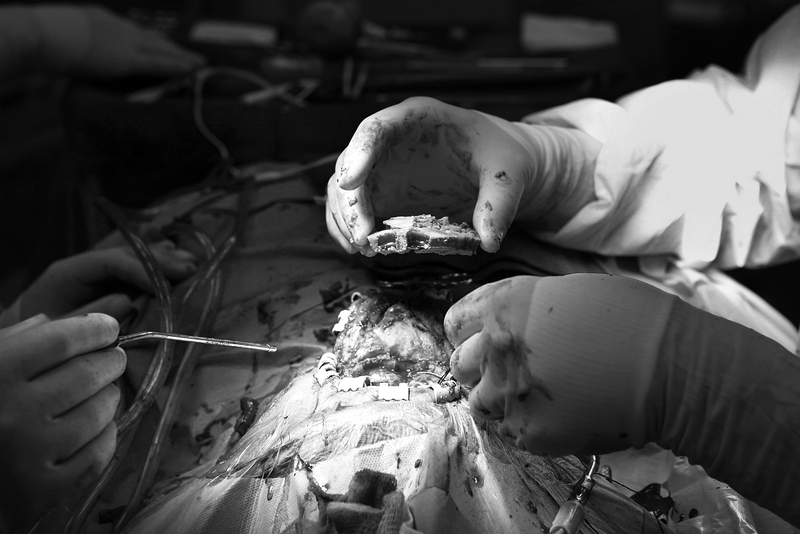 Dr. Logan Douds performs Arturo Martinez-Sanchez's cranioplasty at Valley Hospital in Las Vegas on Sept. 12, 2012. The surgery was to repair an indentation in skull that resulted from a hammer attack. The two lock eyes and, for a moment, stare at each other in a mixture of surprise and delight. Dawn Zito, an admissions coordinator at the rehabilitation center, was the first person Arturo met when he enrolled in the physical- and occupational-therapy program in early summer. He graduated from the program Aug. 23. “How’s it going?” Zito says, smiling broadly as she steps into the room. “It’s going,” Arturo says, bowing his head to show her the new scars from his surgery two days ago. The two reminisce about the day they first met. He could only give yes or no answers. Anything more was stunted by his brain injury. “You’ve come a long way since then,” she says. Arturo nods in agreement, yet lingering impediments frustrate him. He still mixes up words or can’t find the right word altogether. And his memory falters more often than not. He can remember his childhood but forgets the things a doctor told him an hour ago. You hope to never go to the nondescript building near Sahara Avenue and South Rancho Drive. But when the need arises, you’re awfully glad it’s there. It’s where victims of crime — not property crimes such as home or vehicle burglary but violent crimes that leave a person broken physically and emotionally — go for financial aid. These are the offices of the Nevada Victims of Crime Program, which helps people who are swamped with expenses after being hurt. This is where, last April, Arturo Martinez-Sanchez joined 1,963 other crime victims seeking assistance during the fiscal year. Victims of violent crime must report it to police within five days and seek assistance from the program within one year to get help. If a victim qualifies for help, the program assists primarily with medical bills, as the “payer of last resort.” If a person has insurance, the program will help cover deductibles or co-pays. In some cases, the program assists with wage loss, relocation costs in domestic-violence situations and crime-scene cleanup for homicides. There’s a $35,000 claim limit, except for victims with injuries considered catastrophic: paralysis, blindness or amputation. Cases remain open until the money runs out or the victim no longer needs help, Salazar said. Most victims never reach the claim limit. The program assists about 2,500 people each year, Salazar said. Last year, it paid more than $6 million to cover victims’ medical bills and other related claims. The program largely is offender-funded — through restitution, court filing fees and bail bond forfeitures, among others — in addition to a federal grant. Salazar admits bills are often the last thing on a crime victim’s mind. It can be an overwhelming and confusing amount of paperwork. “You just have to hold their hands, give them a hug and help them through the process,” she said. “That’s the problem,” he says, sighing and wrinkling his face. It doesn’t take long for his frustrations to become evident. Zito bids him goodbye and says it was nice to see him. His family shares his worries about a physical recovery: Will he regain lost vision in his right eye? Will his speech ever flow in uninterrupted sentences again? And will the frequent throbbing in his head gradually subside? Arturo voices these worries most often. His family, on the other hand, fears for his emotional well-being, perhaps to a greater extent. Arturo’s stubborn and fiercely independent spirit never missed a beat. He made that clear during his initial hospitalization: As their father, Cristopher and Alejandro would live with him, he told his lawyer. End of discussion. But would the fun-loving and hard-working man who enjoyed motorcycles, boxing and impromptu dances with his wife ever return? A certain spark was missing. That’s when Gaudia says she saw a sign of hope — courtesy of a Kit Kat bar tempting her from across the hospital room. There were three on a table. She wanted just one. Dr. Logan Douds, an endovascular neurosurgeon, talks about Arturo's prognosis for the future. Her brother immediately denied her request, then glanced up at her with a mischievous look in his eye. She lunged for the candy bar. He grabbed it first and taunted her. Finally, he gave her the Kit Kat. And laughed. And, for a moment, Gaudia wondered if maybe, just maybe, her older brother was coming back.